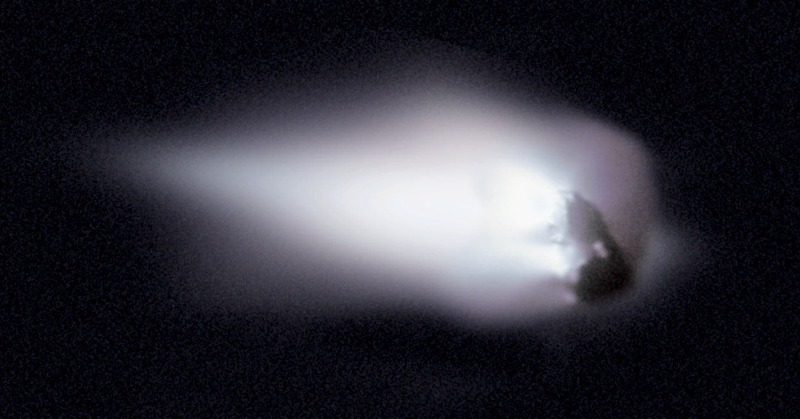 The image above shows the nucleus of Halley's Comet –an orbiting iceberg visible from Earth every 75 years. Stephen Hawking believes that one of the major factors in the possible scarcity of intelligent life in our galaxy is the high probability of an asteroid or comet colliding with inhabited planets. Through Earth's history such collisions occur, on the average every one million years. If this figure is correct, it would mean that intelligent life on Earth has developed only because of the lucky chance that there have been no major collisions in the last 70 million years. Other planets in the galaxy, Hawking believes, on which life has developed, may not have had a long enough collision free period to evolve intelligent beings. We have observed, Hawking points out in Life in the Universe, the collision of a comet, Schumacher-Levi, with Jupiter, which produced a series of enormous fireballs, plumes many thousands of kilometers high, hot "bubbles" of gas in the atmosphere, and large dark "scars" on the atmosphere which had lifetimes on the order of weeks. It is thought the collision of a rather smaller body with the Earth, about 70 million years ago, was responsible for the extinction of the dinosaurs. A few small early mammals survived, but anything as large as a human, would have almost certainly been wiped out. “The threat of the Earth being hit by an asteroid is increasingly being accepted as the single greatest natural disaster hazard faced by humanity,” according to Nick Bailey of the University of Southampton's School of Engineering Sciences team, who has developed a threat identifying program. The team used raw data from multiple impact simulations to rank each country based on the number of times and how severely they would be affected by each impact. The software, called NEOimpactor (from NASA's "NEO" or Near Earth Object program), has been specifically developed for measuring the impact of 'small' asteroids under one kilometer in diameter. Early results indicate that in terms of population lost, China, Indonesia, India, Japan and the United States face the greatest overall threat; while the United States, China, Sweden, Canada and Japan face the most severe economic effects due to the infrastructure destroyed. The top ten countries most at risk are China, Indonesia, India, Japan, the United States, the Philippines, Italy, the United Kingdom, Brazil and Nigeria. What would happen to the human species and life on Earth in general if an asteroid the size of the one that created the famous K/T Event of 65 million years ago at the end of the Mesozoic Era that resulted in the extinction of the dinosaurs impacted our planet. How many times in our galaxy alone has life finally evolved to the equivalent of our planets and animals on some far distant planet, only to be utterly destroyed by an impact? Galactic history suggests it might be a common occurrence. The first thing to understand about the KT event is that it was absolutely enormous: an asteroid (or comet) six to 10 miles in diameter streaked through the Earth's atmosphere at 25,000 miles an hour and struck the Yucatan region of Mexico with the force of 100 megatons -the equivalent of one Hiroshima bomb for every person alive on Earth today. Not a pretty scenario! Recent calculations show that our planet would go into another "Snowball Earth" event like the one that occurred 600 million years ago, when it is believed the oceans froze over (although some scientists dispute this hypothesis -see link below). While microbial bacteria might readily survive such calamitous impacts, our new understanding from the record of the Earth's mass extinctions clearly shows that plants and animals are very susceptible to extinction in the wake of an impact. Impact rates depend on how many comets and asteroids exist in a particular planetary system. In general there is one major impact every million years -a mere blink of the eye in geological time. It also depends on how often those objects are perturbed from safe orbits that parallel the Earth's orbit to new, Earth-crossing orbits that might, sooner or later, result in a catastrophic K/T or Permian-type mass extinction. The asteroid that hit Vredefort located in the Free State Province of South Africa is one of the largest to ever impact Earth, estimated at over 10 km (6 miles) wide, although it is believed by many that the original size of the impact structure could have been 250 km in diameter, or possibly larger(though the Wilkes Land crater in Antarctica, if confirmed to have been the result of an impact event, is even larger at 500 kilometers across). The town of Vredefort is situated in the crater (image). Dating back 2,023 million years, it is the oldest astrobleme found on earth so far, with a radius of 190km, it is also the most deeply eroded. Vredefort Dome Vredefort bears witness to the world’s greatest known single energy release event, which caused devastating global change, including, according to many scientists, major evolutionary changes. What has kept the Earth "safe" at least the past 65 million years, other than blind luck is the massive gravitational field of Jupiter, our cosmic guardian, with its stable circular orbit far from the sun, which assures a low number of impacts resulting in mass extinctions by sweeping up and scatters away most of the dangerous Earth-orbit-crossing comets and asteroids.